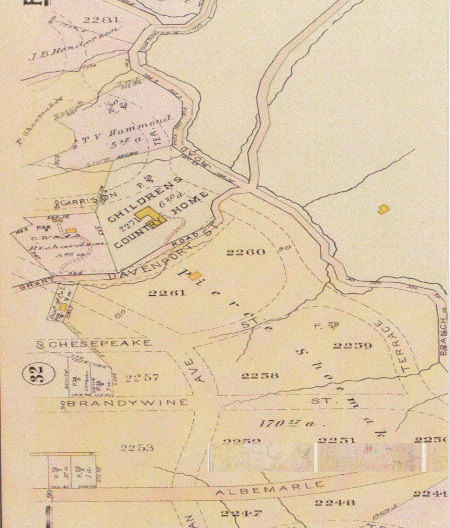 A 1907 Baist real estate atlas shows very little development in what would become Forest Hills. Sure, there were land owners with acres of land, and some roads and streets had been cut through or were marked to be built, but few actual buildings or houses were shown. One prominent building that stands out on this map and is labeled Children’s Country Home. On the map, it is located at the intersection of Grant and Broad Branch Roads. Grant Road was a very old winding trail that was eventually replaced, at least partially, by a much straighter Davenport Street. If the original Children’s Country Home still stands, it is on a different street. The Children’s Country Home was a Forest Hills institution from 1888 to 1929. It was the idea of 20 well-meaning young ladies of St. John’s Protestant Episcopal Church in downtown Washington (“the Church of the Presidents”). In 1883, these young women from families active in Washington society decided that what the city needed was a country home for poor children. Using the concept created by the Fresh Air Fund in New York in 1877, the Children’s Country Home’s purpose was to give poor children from the inner city a place to go in the summer where they could enjoy the beauty of nature, eat healthy food and play. At the time Washington had a population of 177,000 with over 43,000 of those being school-aged children. As the Evening Star said on June 19, 1886, “In the city summer… these children are cooped up in the hottest and most unhealthy part of the city. The dusty streets are their play grounds and the hot brick walls are their cradles at night. Some of them are pale and feeble, wasting away.” Of course, these socially conscious young ladies of St. John’s wanted to help. A country home, the Adler Estate, was rented on Pierce Mill Road near Tennallytown (today’s Tenleytown) by the ladies for the summer of 1883. There were two dormitories for the children, with 15 boys and girls in attendance on alternate two week cycles from June 15 to September 15. Sisters from the All Saints Sisterhood, a Protestant charitable organization in Baltimore, supervised the children and managed the home. The children who stayed in the home that first summer returned to their families relaxed, well-fed and happy. The immediate success of the home in providing a healthy environment for poor children in the summer led the young ladies to hold numerous fundraisers where people of society could visit the Home and see its good work. One annual fundraiser was the “Garden and Pound Party.” Stages left hourly from the foot of High and Bridge Streets to bring the donors to the distant home in Tennallytown. Later, when the home had moved to Forest Hills, guests were advised to take the streetcar up Connecticut and get off at Grant Road and walk 15 minutes to the Home. Other fundraisers included evening society dances and lectures. 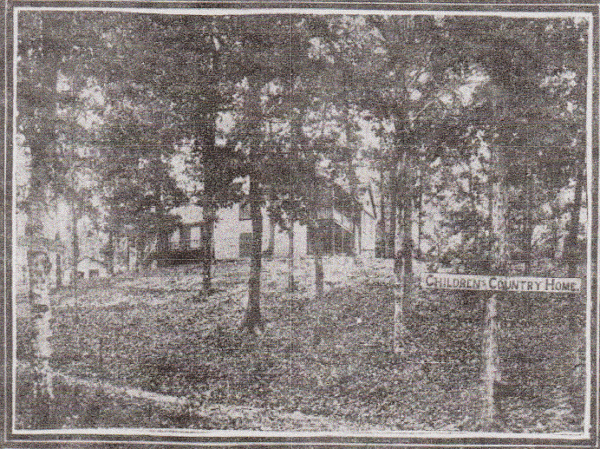 In April 1888 Charles C. Glover, president of Riggs Bank, and his wife, transferred 6 acres of land at Broad Branch Road and Grant Road to the Children’s Country Home. This generous gift was given in memory of their daughter, who had died at the age of 4. Mr. Glover, a very wealthy man who owned a vast amount of real estate in the District, also served as treasurer of the building fund. Glover’s donated property meant that the ladies of St. John’s would be able to build their own country home to meet the specific needs of the participating children. A large and airy design was chosen, with several wide piazzas, and a summer kitchen in the back of the house. A number of outbuildings would eventually adjoin the house. Twenty children, either girls (aged 4-14) or boys (aged 5-8), were guests of the home for two weeks at a time. There were two rules that the children and their families had to agree to before the children could be admitted: they had to promise to stay at the Home at least one week and they had to accept that parents were only allowed to visit the Thursday of the second week of their stay. The children could run through the woods, play on the swings and seesaws, climb the trees, swim in the swimming pool and enjoy the Home’s horse and its carryall. On special days they went blackberry picking or went down to the creek. Chapel services were held twice a day, even though the Home was nonsectarian. On Sundays the children attended St. Albans. The children were given some chores, though not an excessive amount that would interfere with their play time. The older girls were taught needlepoint as they listened to stories read to them by the sisters in the afternoon. The dormitory and wash room were upstairs — the sisters being especially concerned that the children bathe frequently and wear clean clothes. 1905 brought a major shift in the focus and purpose of the Home. The women on the Board of Managers of the Home saw a new need, a country home for children recuperating from illnesses. Since the Home was founded in 1883 other charities, like Camp Goodwill, had stepped in to help poor inner city children spend enjoyable summers away from the slums. In addition, public playgrounds had been set aside in the inner city to improve the lives of children living on the city streets. Consequently, the Board decided the Children’s Country Home would be renamed the Children’s Convalescent Home and only ill children would be admitted as of July 1, 1905. The Home would be a refuge for sick children from local hospitals and orphan asylums that would be referred to the Home by the Associated Charities and District nurses. The procedures for the Home were changed so that patients admitted were allowed to stay until discharged by the Home’s doctor. A volunteer nurse was always in attendance, and two Episcopal Sisters of St. Margaret supervised the sick children. For the first time mothers, and sometimes older siblings, were allowed to stay with the very sick babies. 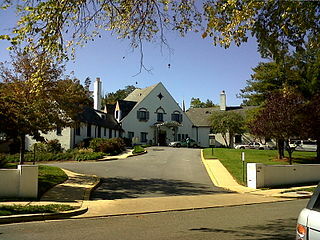 The HSC (Hospital for Sick Children) Pediatric Center at Bunker Hill Road and 18th St. NE. By 1928, the Board of the Children’s Convalescent Home realized that their young patients needed more than summer care. They needed a full time convalescent home. The Board voted to sell the six acre tract on Grant Road and move the facility to a new home on Bunker Hill Road and 18th St. NE. The money received from the proceeds of the sale of the property would go towards building the new home. The new home is now known as the HSC (Hospital for Sick Children) Pediatric Center. The movement of the Home across town paralleled the development of Forest Hills. The extension of Grant Road to Broad Branch Road would be replaced by the new Davenport Street (note that the road into Rock Creek Park at Davenport Street is still called Grant Road). And the former Children’s Country Home would become a private residence on a quiet street in Forest Hills in 1931. Thank you to Anne Rollins for her research help. Fascinating article! Great research Ann.